For Paper Batik designs and techniques. Ready to use liquid wax. Artmaster Pearl Angled Watercolour Brushes are excellent value synthetic brushes for all waterbased media including acrylic which keeps it's shape well and has good colour holding capacity. This brush has a flat shape with an angled edge. Artmaster Pearl Flat Watercolour Brushes are excellent value synthetic brushes for all waterbased media including acrylic which keeps it's shape well and has good colour holding capacity. Artmaster Pearl Round Watercolour Brushes are excellent value synthetic brushes for all waterbased media including acrylic which points well and has good colour holding capacity. In this full colour book Isobel Hall demonstrates how to use Brusho Crystal Colour. There are ste by step instructions, and illustations, that will guide you through a range of different technique. Contains 25 pages. Gouache Studio sets from Caran D'Ache containing vibrant water-soluble gouache in a natural binder. Wallace Seymour Co-co Bello Fast Drying Oil Glaze Medium is used to add depth and gloss to oil paint, especially transparent colours. Wallace Seymour Co-co Bello diluent is used for thinning oil paint. Co-co Bello is a plant based extract which is 100% non hazardous, non-flammable and presents no threat to the environment. Aquafine Gouache colours are made from a selection of modern high-quality pigments milled to perfection to offer optimal performance. Quality sable watercolour brushes at student prices. Aquafine Watercolour range offers free-flowing, vibrant and transparent watercolours. This Daler-Rowney Georgian Oil Colour Studio Set brings you ten 38ml tubes of high-performance oil colour at an excellent price. 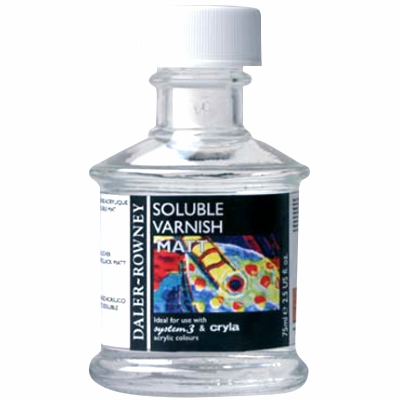 Daler Rowney Soluble Matt Varnish is a removable matt varnish for use with acrylic or oil paints. 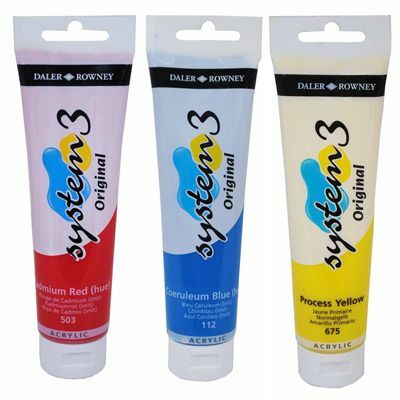 This System 3 Original Acrylic Introduction Set of 10 tubes and comes from Daler-Rowney. This Daler Rowney acrylic paint set contains 10 x 37ml tubes of System 3 Original acrylic paint. Create uniquely textured artworks with Daler Rowney Texture Paste. 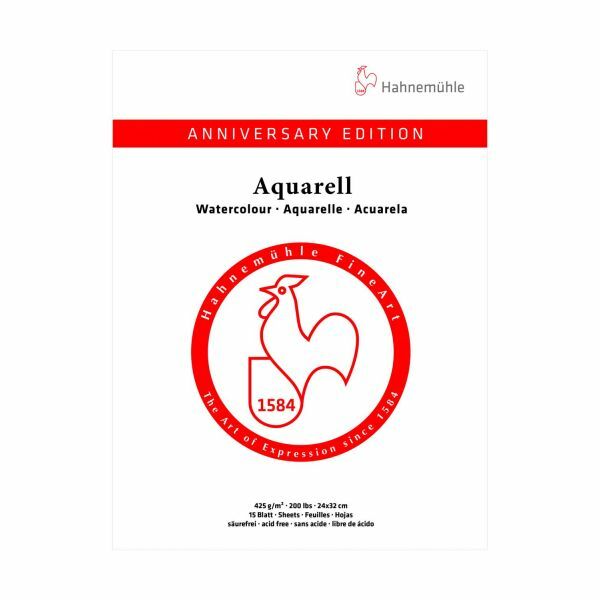 The perfect introduction to the range, this great value set is ideal for artists looking to explore the world of Aquafine Gouache. The Reeves Tear Off Disposable Paper Palette Pad can be used as a palette for oil or acrylic paints. Each disposable palette pad contains 40 sheets of palette paper. Versatile and practical, Jakar's brush tub is a great solution for storing and cleaning brushes during creative work. Loxley Gold Standard Canvases are made from 100% 11oz cotton duck canvas and are primed with three coats of acrylic primer which gives the canvas a medium grain. Suitable for both oil and acrylic paints, the 18mm deep staple free edges allow the picture to continue around the sides of the canvas. Available in a comprehensive range of sizes at discounted prices. Linen Canvas with clear pimer on 20mm stretchers.